Outta Nowhere!!!! 5 Stars Conquered! Needs more 5 star ratings!!! I'll be honest. I saw the picture and thought the characters looked interesting and was drawn to the expression on the girls face in the top left, with that I hit play. Upon finding out this is a guy I found myself in one of the most insane, laugh out loud funny, and action packed anime I have seen, far exceeding my imagination. Its like the title image is a taunt "what could you possibly imagine this show is" and then the anime sets out to conquer and blow away your imagination. I couldn't predict anything, the characters were all relatable and well realized, the art was great and the story was really intense. Its a mix of so many things if you like anime at all you will likely enjoy this one a lot! Extremely Unique, Unexpectedly Great Series! "May the light of Zvezda shine throughout this world!" This is a review based on the first episode so far. This anime has already won my heart, and of course the leading factor is the the cute loli they introduce that will most definitely conquer the world with her minions. Who is this cute conqueror of our world? Lady Vanera, thats who. The second she appears in her costume of conquest the anime takes a serious yet comic roll and i must say it was perfect! The animation of "World Conquest Zveda" i believe is stellar, especially for it's moe feel, along with what seems to be very unique character designs. Almost everything so far feels very original, the scene, the story, it all feels like it combines into one delicious spicy curry dish. The Story has already seemed to be very interesting, the cutest loli taking on the roll of world conqueror and the introduction of what seems to be a god from Norse mythology. In the first episode you already have so many questions but not so many that your completely lost if you use common sense to understand whats happening. The music i don't have much to say on, to be honest there was nothing that grabbed me in that compartment yet, but it is only episode 1 and everything else about this anime already grabs me! I have a feeling im going to enjoy this anime to the fullest! Was this actually that good? Basically a quit smoking ad campaign. I don't know this anime isn't good or bad. It's just pretty bland. The show probably could have drawn me in more if the fight over good and evil wasn't smokers vs nonsmokers. Now this is my kind of anime. WORLD CONQUEST! I must say. I went in not knowing what to expect. The title got me curious, and the team seemed quite unique. Yes, it may seem really random at times, but it also gets down to business. I love veneras power, to conquer people through persuasion. I'm especially excited to see how much asuta matures into being a great member of zvezda. The fact that he himself says he wont be conquered brings up even more curiosity with the connection between venera and asuta. I enjoyed this series entirely too much. It was colorful, funny, interesting and adorable! I really hope there is a season two but it looks like there haven't been too many views on the show. I would watch this show over and over again. The main characters all have amazing and interesting character development. This anime is very weird and fun. I really enjoyed all of the characters and can't wait for another season. 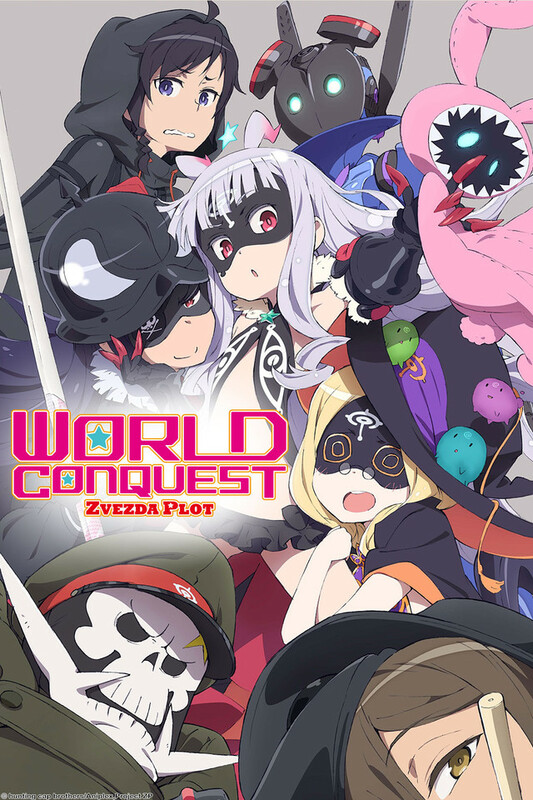 The anime is about this little girl who is the leader of a world conquering organization called Zvezda, she finds a runaway named Jimon Asuta and ropes him into her organization. The action in this anime is superb and some of it is a little nonsensical, but it's a lot of fun to watch. The only draw back is that the anime went a little too fast for me and I don't feel like the smoking thing was properly explained, but I would love to see another season. i stumbled on this show a few weeks ago and it was A fantasic comedy to watch off and on. probably one of the best shows of Last Season. if you can get past the first episode, which is a bit on the slow side, you are in for an amazing ride. i highly recommend it. I started watching this anime cause i was bored. However, i quickly got drawn into it all the way to the end. It is just kind of addicting and definitely an easy watch. Quick round up, the characters are nice, and you are at least given enough development to know their personalities and actually care about them. The animation is standard fair but can be great at times. The music is meh, its there and that's about it. If your bored and watch a new show to watch i definitely recommend this.